"As you start holiday shopping, consider unique and life-changing items from World Vision’s Gift Catalog. The beauty of these items is the two-for-one benefit they provide: 1) a meaningful and affordable gift for a loved one; 2) proceeds that make a difference in the lives of children and families living in poverty in the U.S. and around the world. Check out “The True Spirit of Christmas Tour” Facebook page at www.facebook.com/truespiritofchristmas. For the third consecutive year, World Vision staff will be traveling across the world this December to see the impact that goats, sheep and other gifts have on families and children." 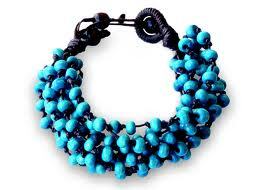 Thai Bracelet: This handcrafted Thai turquoise bracelet was made in a project that helps protect vulnerable girls from exploitation. What we thought: We love gifts that give back:) This is a really pretty bracelet, but the best part about giving or receiving something from the World Vision Catalog is knowing you are helping someone in need. The cool thing about World Vision is they tell you exactly what your purchase can provide and for whom. Whether it is livestock, clean water, shelter or another basic need, you will know exactly how you are impacting a fellow human being's life. Giving these gifts will definitely give you the warm fuzzies this holiday season! ABCD Diaries gives World Vision an A+! Buy It Check out the World Vision catalog here. Also follow as the Sleepy Dreamer. I entered the Heart of Haiti giveaway. entered Disney's Sing and Storytelling Belle from Tollytots!